The luxury fashion brand's activation includes prize giveaways. 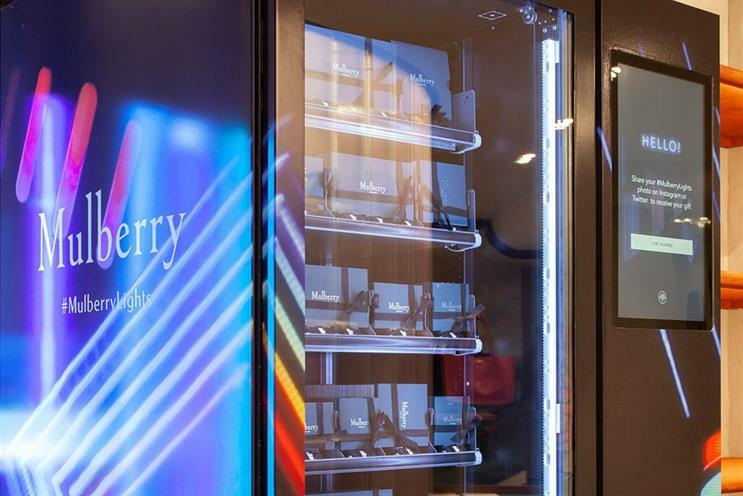 Mulberry has created an in-store lighting-themed experience and smart vending machine to entice customers to play for prizes. The initiative, which is tied to the brand’s "#MulberryLights" campaign, celebrates how light, colour, shapes and people come together to create a modern British Christmas. The campaign kicked off at the end of last week with a pop-up light installation, drinks and live music at the brand's Regent Street flagship store. For the in-store experience, a smart vending machine is designed to reward participation, amplify social engagement and capture data. The experience invites users to share their lights-inspired images with the hashtag #MulberryLights in order to gain instant access to the prizes stored. The machine verifies that the social media share has taken place on either Instagram or Twitter, then invites users to interact in a bespoke gaming experience through its digital portal, before rewarding them for taking part. Each day, one player will win the top prize of a £1,000 gift card. Other prizes include small leather goods, stickers and festive chocolate. Every user can also enter a competition to win a further £5,000 to spend on gifts at Mulberry. The installation ran in Mulberry’s Regent Street store during 15-18 November and will now head to Leeds during 22-25 November and Manchester during 26-28 November, with a final stop in Edinburgh from 29 November to 2 December. A second machine will appear in New York in December. The experience was produced by TheCurrent.